One of the mysteries of human behaviour is why we sometimes act with completely selfless altruism. When asked to play totally anonymous games in which we can cheat without anyone else ever finding out, very often we don't. Instead, we play the game fairly, which results in a cost to ourselves (compared with what we could've had) and a benefit to the stranger. That's a mystery because evolution says that organisms which don't act to maximise benefit to themselves - whatever the cost to others - should die out. Several explanations have been put forward, but one of the most intriguing stems from the fact that we live in social networks. In a network like this, we depend critically on the kindness of others. A new study has looked at how altruistic behaviour can be transmitted between players in the kinds of anonymous games that social psychologists are so fond of. The data were from some earlier experiments in which 240 people played the games over six rounds, each time with different partners (all anonymous). What they found was that the amount individuals contributed in one round was affected by how generous their partners were in previous rounds. If they played with generous people in round 1, then they would be more generous to the new partners they had in round 2. In fact, they showed that this effect was propagated through new partners. 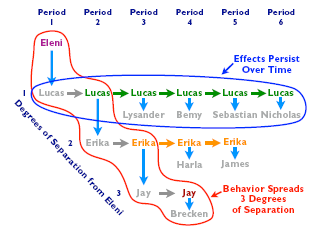 As you can see in the figure, if Eleni was generous to Lucas, then Lucas would be generous to Erika, and Erika more generous to Jay. Unselfish acts propagated out to 3 degrees of separation. When you remember that only 6 degrees of separation stand between you and every other person on the planet, you can understand how powerful and important this effect is. Full article by Tom Rees from Epiphenom (a great site if you haven't already checked it out).